Donald Paul Breeden had 9 other crew members in his B-17 C 42-3436. From all kinds of walks of live before they met and flew together. Below a summary of what I know of them. Of those who died over Eygelshoven and those who were picked up by the Germans after parachuting down. Mentioned from nose to tail. Co pilot: 2nd Lt. Donald Paul Breeden - he is mentioned on the Walls of the Missing at Margraten. Born on 9th of April 1921 and went to school in Worley, Idaho. Enlisted on April 9th 1941 in San Francisco, married Margarette Talbot on November 1st 1941 and is MIA since October 14th 1943. Declared legally dead on October 15, 1944. In MACR 1034 pilot McDarby supposes that ‘he was not seen on the ground by any of the living crew members so they presume he evaded capture for some time.’ Which appeared incorrect. Photo thanks to Sue Moyer (SSMA) and Donald’s child Donna and his grandchildren Beth and Charlotte. Navigator: 2nd Lt. William James Martin - buried at Margraten - in grave B/15/19. Born on 16 August 1920 in Denver Colorado, and lived in Paducah - McCracken County - Kentucky. On November 1, 1943 Lt Martin was reported missing in action since October 14, to his mother, Mrs Gus (Josephine) Davenport. From The Paducah Sun-Democrat, on November 1, 1943: 'Lt. Martin left the US for England in September. He graduated June 24 at the San Marcos Texas aerial navigation training base and received his wings and commission there. He applied for cadet training while a student at Murray State Teachers college and was ordered to report for duty in December 1942 at Kelly Field San Antonio Texas. Mr Martin was born in Denver (Colorado) and lived in Paducah since 1939. He was employed at the Columbia theater during vacations. Thanks to mr Matt Jaeger from the McCracken County Public Library and LaDonna Hamontree from Pogue Special Collections Library at Murray State University. We are still looking for his relatives. Bombardier: 2nd Lt. Harvey Arlie Manley - buried at Margraten - in grave F/20/17. Born September 29, 1920 in Blackwell - Kay County - Oklahoma. His parents Mr John and Mrs Bertha Manley in 1943 lived in Alamo - Hidalgo County, Texas. He went to public school in Enid Oklahoma. Partly from The Brownville Herald of November 24 1943: Second Lt Harvey A. Manley has been missing in action since October 14 the day of the great daylight raid on Schweinfurt. Lt Manley graduated from Donna High School and was attending agricultural colleges at Kingsville A&I college when he joined the air forces on February 26, 1942 in Randolph Field. He was commissioned as a bombardier at Midland Texas on 17 December 1942 and completed a navigation and radio course in May 1943 before going overseas in September of this year (1943). After Harveys death his parents moved back to Ponca City - Kay County Oklahoma. To the ranch Harvey should have taken over after the war ended. Photo from Fields of Honor. Left waist gunner: Sgt. Leonard Roy Henlin - buried at Margraten - in grave B/21/26. He is supposed to being killed in mid air on his gun position (waist left) by enemy action (Crawford in MACR 1034). This was confirmed by one of the crew members who wrote a letter to Mr. Henlin’s mother. Mrs. Deborah Henlin, a niece wrote to me: ‘I also have a copy of a letter from one of the crew members Mr. Roberts (written August 17, 1945) who survived the plane landing and spent the rest of the war in Stalag 17 to my grandmother... he expresses his condolences and assured her that my uncle Roy died instantly at his post in the plane by a 20 mm shell‘. She also has the Purple Heart medal of her uncle. Born on April 13th 1911 in Warwick-RI, from Smithfield in Providence County, Rhode Island, where he also enlisted on September 4, 1942. With his 32 years Henlin was the senior of this crew. Prior to entering the service he worked as a spinner at the Esmond Mills, and played base ball with the Greenville Townies. Mr. Henlin received his ‘flexible gunnery’ training at Army Air Bases in Nebraska, Washington and Long Beach, California. Here you can read more on Roy Henlin. Mr. Henlin is also remembered in his hometown Smithfield. Text partly form ‘The Smithfield Times’ July 2016 / Jim Ignasher and from Kate Wells of the Providence Public Library. Photo thanks to Deborah Henlin, Roy’s niece, and Mrs Shirley Henlin, the widow of Mr Errol Henlin; a brother of Roy. He helped Ben Roberts out of his ball turret, but was fatally injured before bailing out (Roberts and Crawford in MACR 1034). However Mr Lepore stated that ‘he had no bullet wounds but all his bones were broken, presumably when the ‘ship’ hit the ground’. Mr Lepore also stated that Wells his parachute was open in the tail (MACR 1034). Born January 16, 1923 in Webster County, Kentucky, USA. Now buried in Pythian Ridge Cemetery - Sturgis/Union County - Kentucky. He had one sister Nancy who married a Bernard Musgrave. Nancy died in Evansville Indiana in 2006 as Nancy Musgrave. Photo from Michel Beckers / Ron Putz at ‘Finding a Grave’. Mr. and Mrs. Sam C. Wells, near Wheatcroft, were notified Monday that their only son, Sgt. 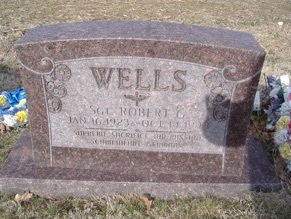 Robert G. Wells, 20, previously reporting missing, was killed in action on October 14. Sgt. Wells, a waist gunner on a flying fortress, was killed in a raid somewhere over Germany. The young man volunteered for service on November 2, 1942. He received his training at Atlantic City, N.J., and received his gunner's wings and the rating of Sergeant at Ft. Myers, Florida, in January, 1943. Sgt. Wells was a graduate of Wheatcroft High School, where he played on the basketball team, and had attended Murray Teachers College. The last letter his parents received from him was written on Oct. 11, and in it, he said, "Above all, I don't want any of you to worry about me, for I am only doing what thousands of others are trying to do, make this a better world to live in." Surviving are his parents; one sister, Miss Nancy Wells, of Evansville, Indiana; a number of Aunts, and other relatives. Mr. and Mrs. Wells have received from Gov. Keen Johnson a certificated stating that their son has been commissioned posthumously as an aide-de-camp on the staff of the Governor with the rank of Colonel, in recognition of valor and heroism displayed. Dennis McDarby was born March 30, 1923, graduated from Auburn High School in 1942 and from the University of St. Louis in St. Louis. Mr. McDarby was a U.S. Army Air Corps veteran, serving as a lieutenant and a pilot during World War II. He was a member of the 305 Bomb Group. He fractured his ankle while bailing out on October 14, 1943 (MACR 1034). Mrs. Marilyn Walton on September 2, 2016 added that ‘Dennis McDarby was one of my father’s roommates at Stalag Luft III – South Compound, Barracks 128, room 15.’ From an interview with Mr. McDarby Mrs. Walton learned that he went to Mass before every mission, and that a French priest (Father Goudreau from Quebec) in POW camp had Mass when he was there and on Holy Days. He also told Mrs Walton that in the POW camp, they had two bridge tables always going. He said my father - Mr Jeffers - was not good at bridge. Also poker was played a lot. Mr. McDarby was liberated at Stalag VII-A near Moosburg, but spent most of his POW days at Stalag Luft III in Sagan, Germany. He was one of the many US pilots who force marched 52-miles in January 1945 to Spremberg, Germany, and loaded onto overcrowded, filthy boxcars. From there the Americans were taken to Stalag VII A in Moosburg, Germany, where he and many other POWs were liberated on April 29, 1945. He was a life member of the American Legion and 8th Air Force Historical Society and died May 22, 2006 in Morristown - Shelby County, Indiana. He is buried at Asbury Cemetery. Photo from Fields of Honor - Auburn High School yearbook 1941. Dennis James McDarby, 83, of Morristown, died on May 22, 2006, at Manor Care South in Indianapolis. Born on March 30, 1923, in St. Louis, Mo., he was the son of Neal and Virginia Calvin McDarby. He was a 1942 graduate of Auburn High School and graduated from the University of St. Louis. His marriage was to Patricia Kain in 1946, and she died in 1960. He married Julia A. Redmon on July 21, 1984, and she survives. He served in the U.S. Army Air Corp as a lieutenant and a pilot during World War II. He served as a member of the 305 Bomb Group and was an American ex POW. Mr. McDarby was a supervisor at Freudenberg-NOK in Shelbyville and Morristown, retiring in 1985. He was a member of St. Joseph Catholic Church and a life member of American Legion and 8th Air Force Historical Society. McDarby’s burial will be at Asbury Cemetery. Engineer and top turret gunner Arthur Linrud was born on a farm north of Velva, North Dakota on November 23, 1920. He graduated from high school in 1939. Art was drafted in the army and reported for basic training on October 8th 1942. Art ended up in the Army Air Corp and after training and passing many physicals he became a heavy bomber flight engineer, top turret gunner. He was not part of the original crew but a replacement for the TTG/FE Watts who was in hospital for frostbite. Read how Arthur Linrud became a crew member. Photo: from collection of Michel Beckers. The information in his personal stories I got from his daughter JoAnn Linrud. Born on 9-9-1922 in Shelburn-Indiana he enlisted in Evansville on October 21, 1942. Hosea Faine Crawford was raised by his parents Hosea Harrison and Goldie Crawford(-Crockett) in Shelburn, Sullivan County in southern Indiana. Hosea had very little formalized education and joined the air force during WWII. After his service and POW-time he returned to the U.S. and married Constance Anne (Connie) Virga from New York. Hosea met Connie after the war in New York as she wrote to him while he was imprisoned in Stalag 17 as part of the Red Cross effort to keep up the spirits of American GI’s. After they were married Hosea left the air force to work in the Federal Aviation Administration (FAA) as an air traffic controller. He lived in many places including Washington, Massachusetts, Alaska and Indiana. They had seven children and divorced in 1960. Hosea died in 1990 and is buried in Sahuarita/Pima County, Arizona. Connie died in 2012. Photo: Mr Crawford in 1955. Most other information from his son Dean Crawford. Benjamin F. Roberts (* 21(?) July 1923) was a Sergeant in the Army during World War II. Benjamin resided in Genesee County, Michigan before enlisting on November 10, 1942. At the time of enlistment, Benjamin was 19 years old, had 4 years of high school education and was single, without dependents. Roberts stated that he saw Henlin and Wells dead near the ball turret when he inspected the tail part on the ground after the crash landing of the tail part (MACR 1034). Mr Roberts now lives in Decatur, Alabama. Photo from the DecaturDaily article. Dominic Charles Lepore was born March 25. 1921 in Elizabeth, New Jersey and went to Thomas Jefferson Highschool in Elizabeth, New Jersey where he was captain of the wrestling team in 1938. He was a Sergeant in the Army during World War II. Dominic enlisted on September 25. 1942. At the time of enlistment, Dominic was 21 years old, had a grammar school education and was single, without dependents. One year later, Dominic had to bail out after being injured by 20 mm shell in his plane (MACR 1034), then captured by the Nazis and sent to Stalag 17B near Krems - north of Vienna in Austria where 3,219 other American POWs were held. From his son Dennis: ‘Very quickly he came home to Elizabeth NJ and married my mom, Margaret Lucille Crincoli. Dominic opened up a used car lot and worked very hard. The law permitted being open on Sundays at this time so he was rarely home. Dominic and Margaret had a daughter who they named Donna Michelle Lepore and later a son, me, named Dennis Charles Lepore. By 1955 and working hard, Dominic became the owner of a General Motors Oldsmobile Dealership in Linden NJ. As that dealership and surrounding property grew he added on a Japanese Mazda Automobile Dealership to his property. They are all gone now and as the economy in the U.S. under President Jimmy Carter, went downhill and inflation rose, sales dwindled to a standstill. It was the deepest and longest recession in the U.S. and even took 2 years into Ronald Reagans term to pull us out. Both automobile franchises are gone now, however they gave the family a gracious and debt free living and growing up in the best private schools and universities. He never ate potatoes after being a POW because when they did get food in the camp it was potato soup with no potatoes in it. So I will never forget the night my father was invited to eat over my father and mother in laws home in Edison, N.J. and they served all of us potato soup first before the main course. He excused himself from not eating it, we understood. Mr Dominic Lepore did not want to remember anything about the war, let alone being a POW but one evening when his son Dennis was young at the kitchen table I asked him why there were no uniforms or really any military memorabilia in the house in Linden. He told me (his son Dennis) that he threw everything in the ocean on his trip back to the states. Mr Lepore died 3 May 1995 and is buried at Saint Gertrudes Roman Catholic Cemetery in Colonia - Middlesex County. His last known address was in Pompano in Broward County-FL and before that in Metuchen - Middelsex County-NJ. Photo from Fields of Honor - the yearbook 1938 of Thomas Jefferson High School in Elizabeth, NJ. Back to the story I started to find out why and how Donald Paul Breeden could get missing.